You'll want to concentrate on yellow and orange fruits and vegetables, plus egg yolks and fatty, cold-water fish. related macular degeneration (AMD)—a condition that causes vision loss in the macula, the part of the eye that controls central vision. "While there is no definite proof, some studies suggest that eating a diet rich in certain nutrients may help," says Dr. Ivana Kim, associate professor of ophthalmology at Harvard Medical School. Some evidence shows that dietary antioxidant vitamins and minerals (A, C, and E, and the mineral zinc) may help prevent the progression of macular degeneration. "The retina, especially the macula, is thought to be an environment of high oxidative stress, meaning that there is an abundance of free radicals—molecules that damage proteins and DNA within cells. 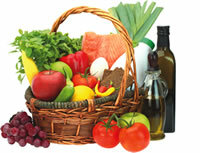 Antioxidants fight free radicals and are thought to help protect the retina from this damage," explains Dr. Kim. Lutein and zeaxanthin are carotenoids found in the retina, and dietary intake of these compounds has been shown to have antioxidant properties and to improve pigment density in the macula. This pigment protects the cells in the macular area by absorbing excess blue and ultraviolet light and neutralizing free radicals. Lutein and zeaxanthin are usually found together in food. Dietary intake of the omega-3 fatty acid DHA (docosahexaenoic acid) may be important to retinal health. "DHA is present in high concentrations in the outer segments of retinal photoreceptors," says Dr. Kim. "Omega-3 fatty acids have been shown to have anti-inflammatory properties, and there is evidence to suggest that inflammation plays a role in AMD." You'll find lutein and zeaxanthin in most fruits and vegetables, especially yellow and orange varieties and leafy greens. Egg yolks are an even richer source of these nutrients. Omega-3 fatty acids are found in coldwater fish, flaxseed, and walnuts. Good sources of zinc include red meat and shellfish. You'll find vitamins A, C, and E in many vegetables, fruits, nuts, and seeds. Research hasn't proved how much of these nutrients we need in order to help prevent eye problems, but Dr. Kim suggests following a heart-healthy diet with fish at least twice a week and at least five servings of fruits and vegetables daily.